Brightly coloured fantasy adventure with a decent premise, but the animated sections don't really work, despite the efforts of a talented cast and Madonna. 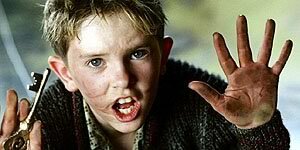 Written and directed by Luc Besson, Arthur and the Invisibles stars Freddie Highmore as Arthur, a young boy who lives on a New England farm with his grandmother (Mia Farrow). When a businessman (Adam LeFevre) threatens to take the farm away, Arthur tries to recover some treasure that was buried by his explorer grandfather (Ron Crawford) before he disappeared three years ago. Whilst searching for clues to the treasure's whereabouts, Arthur uncovers instructions for entering the miniature (and animated) world of the Minimoys, who live under the ground. Once there, Arthur meets a feisty princess (Madonna) and has to rescue his grandfather and foil an attack by the evil Maltazard (David Bowie). Freddie Highmore is practically the poster child for likeable 10-year-old leads and he does excellent work here, at least until he gets Minimoysed (in the film's best joke), at which point his character becomes a lot less engaging. There's also good support from Mia Farrow in the live-action sections and David Bowie makes an excellent villain in the animated bits. It's distinctly strange to hear Madonna playing the romantic lead to someone almost 40 years younger than her, whilst some of the other big names (Robert DeNiro, Harvey Keitel) aren't given nearly enough screentime or dialogue to make an impression. However, the biggest problem is that the animated sections are too chaotic to really engage properly: it's impossible to tell what's going on in the action sequences and the humour never really works. It also doesn't help that the majority of the characters look like cheaply produced Troll Dolls. With a decent script, this could have been charming, but it's let down by chaotic direction and ultimately doesn't do anything that last year's The Ant Bully didn't do a hundred times better.